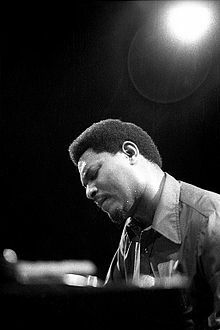 Alfred McCoy Tyner (born December 11, 1938) is a jazz pianist from Philadelphia known for his work with the John Coltrane Quartet and a long solo career. Tyner was born in Philadelphia as the oldest of three children. He was encouraged to study piano by his mother. He began studying the piano at age 13 and within two years music had become the focal point in his life. When he was 17, he converted to Islam through the Ahmadiyya Muslim Community and changed his name to Sulieman Saud. His neighbors in Philadelphia included musicians Richie Powell and Bud Powell. Tyner started his career in 1960 as a member of the Jazztet led by Benny Golson and Art Farmer. Six months later, he joined the quartet of John Coltrane that included Jimmy Garrison and Elvin Jones. He worked with the band during its extended run at the Jazz Gallery, replacing Steve Kuhn (Coltrane had known Tyner for a while in Philadelphia, and performed one of the pianist's compositions, "The Believer", as early as 1958). He played on Coltrane's "My Favorite Things" for Atlantic. The band toured almost non-stop between 1961 and 1965, recording the albums Live! at the Village Vanguard, Ballads, Live at Birdland, Crescent, A Love Supreme, and The John Coltrane Quartet Plays for Impulse!. While in Coltrane's group, he recorded albums as a leader in a piano trio. He also appeared as a sideman on many Blue Note albums of the 1960s, although he was often credited as "etc." on the cover of these albums to respect his contract with Impulse! Records. His involvement with Coltrane came to an end in 1965. Coltrane's music was becoming much more atonal and free; he had also augmented his quartet with percussion players who threatened to drown out both Tyner and Jones: "I didn't see myself making any contribution to that music... All I could hear was a lot of noise. I didn't have any feeling for the music, and when I don't have feelings, I don't play". In 1966, Tyner rehearsed with a new trio and embarked on a career as a bandleader. After leaving Coltrane's group, Tyner produced a series of post-bop albums released by Blue Note from 1967 to 1970. These included The Real McCoy (1967), Tender Moments (1967), Time for Tyner (1968), Expansions (1968) and Extensions (1970). He signed with Milestone and recorded Sahara (1972), Enlightenment (1973), and Fly with the Wind (1976), which included flautist Hubert Laws, drummer Billy Cobham, and a string orchestra. His music for Blue Note and Milestone often took the music of the Coltrane quartet as a starting point. Tyner also incorporated African and East Asian elements in his music. On Sahara he played koto in addition to piano, flute, and percussion. These albums have been cited as examples of innovative jazz from the 1970s that was neither fusion nor free jazz. Trident (1975) is notable for Tyner's use of harpsichord and celeste, instruments heard rarely in jazz. During the 1980s and 1990s Tyner worked in a trio that included Avery Sharpe on bass and Louis Hayes, then Aaron Scott, on drums. He made solo albums for Blue Note, starting with Revelations (1988) and culminating in Soliloquy (1991). After signing with Telarc, he recorded with several trios that included Charnett Moffett on bass and Al Foster on drums. In 2008, he toured with a quartet of Gary Bartz, Gerald L. Cannon, and Eric Kamau Gravatt. Tyner is considered to be one of the most influential jazz pianists of the 20th century, an honor he earned during and after his time with Coltrane. Although he was a member of Coltrane's group, he was never overshadowed by Coltrane. He complemented and inspired Coltrane's open approach. His style of piano is comparable to Coltrane's maximalist style on saxophone. Tyner and Coltrane used similar scales, chordal structures, melodic phrasings, and rhythms. Tyner, who is left-handed, plays with a low bass left hand in which he raises his arm high above the keyboard for an emphatic attack. His right-hand soloing is detached and staccato. His melodic vocabulary is rich, ranging from raw blues to complexly superimposed pentatonic scales; his approach to chord voicing (most characteristically by fourths) has influenced contemporary jazz pianists, such as Chick Corea. Tyner is the older brother of Jarvis Tyner, executive vice chairman of the Communist Party USA. On July 16, 2005, Tyner was awarded an Honorary Doctorate of Music from Berklee College of Music at the Sala dei Notari during the Umbria Jazz Festival. McCoy was a judge for the 6th, 10th and 11th annual Independent Music Awards to support independent artists' careers. ^ a b c d e Yanow, Scott. "McCoy Tyner". AllMusic. Retrieved 22 September 2018. ^ "McCoy Tyner Biography". Mccoytyner.com. September 11, 2007. Archived from the original on May 9, 2008. Retrieved June 25, 2012. ^ Turner, Richard Brent (2003). Islam in the African American Experience. Indiana University Press. p. 140. Retrieved June 25, 2012. ^ Lewis Porter, John Coltrane: His Life and Music, p. 266. ^ Lewis Porter, John Coltrane: His Life and Music, p. 268. ^ Ratliff, Ben (29 August 2010). "McCoy Tyner Honors Charlie Parker at Marcus Garvey Park". The New York Times. Retrieved 22 September 2018. ^ "Hank Jones, Mccoy Tyner, Enrico Rava Honored by Berklee College of Music at Umbria Jazz", Jazz News, 2005. ^ "Independent Music Awards – 6th Annual Judges". IndependentMusicAwards.com. October 5, 2009. Archived from the original on October 5, 2009. Retrieved June 25, 2012. ^ "11th Annual IMA Judges. Independent Music Awards. Retrieved September 4, 2013. Wikimedia Commons has media related to McCoy Tyner.